Sometimes we all need a little encouragement. A smile, a hug and a high-five are warm and wonderful ways to offer support. While actions are powerful, hearing the right string of words can sometimes be the best medicine. The Squeegees, an LA-based band, hits just the right notes with today’s world premiere video for “I Can I Can,” a song from their forthcoming album Veggie Soup. “I Can I Can” with its familiar verses “I think I can I think I can…/You can you can” is a refreshing, versatile anthem that all kids should keep in their back pocket. It works for grown-ups too, particularly during the morning prep before school and bedtime routine. Ahem. The Squeegees have recorded and are ready to release Veggie Soup but are looking for a little support of their own. To help with post-production costs, The Squeegees have launched a Kickstarter campaign. The campaign ends on October 8 so you still have 6 days to lend a virtual hand if you’d like. Check out the video and read on to learn more about the band. And if you are in the Los Angeles area on October 18, 2014 don’t miss The Squeegees at The Rose Bowl for the Kidspace Pumpkin Festival! The Squeegees’s consists of songwriters Samantha Tobey and Pierre de Reeder, along with members Chris Phillips, Moni Wood, Adriana Suyama, and Anne Marie Ceralvo. The band shares a passion for interacting and working with children. Samantha brings a natural flair and years of experience as a “Mommy and Me” instructor and baby sign language teacher to her passion for interacting and working with children. Pierre is a father of two, a music producer, studio owner, and founding member of the seminal Los Angeles band Rilo Kiley, while Chris has charmed many audiences as the drummer for The Squirrel Nut Zippers. 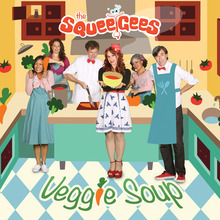 Through very melodic songs with rich harmonies that are not only addictive but also educational, The Squeegees have provided an enjoyable medium for kids and parents alike to learn about eating healthy, nature, movement, eco-consciousness and animal welfare. « View this: “La Clave” – ¡Uno, Dos, Tres con Andrés! + Music tutorial!